I remember there was a period corn fritters were all the ‘craze’ for brunch options. Suddenly all the cafes in Melbourne started churning out their own takes. That might have been why these delicious morsels sneaked in my weekend repertoire and so far has been the go-to dish when I don’t know what else to make. What’s not to love? Cripsy on the outside, fluffy interior, not to mention packed full of delicious vegetables. In fact, apart from corn, you could pretty much use any vegetables you can think of for this. Can’t live without meat? Sure… add some bacon, or maybe some salmon? The sky’s your limit. Making vegetables into fritters is the easiest way to transform boring ingredients to something a little more impressive and ‘fun’. I’ve since experimented with zucchini, chickpeas, carrots, and even Quinoa! 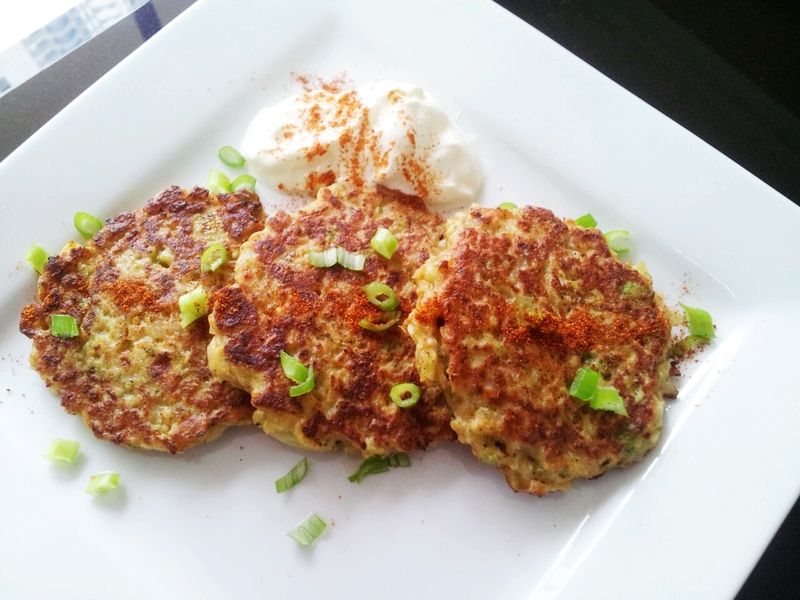 When I pulled out a head of week-old broccoli and even older cauliflower from the fridge the other day I figured I’d try making fritters with them. Frank doesn’t really like either of this two, so when I cook them he would make a face before diving in with his fork. And I can only take that many gratins in a month. When the dish was set in front of him his face lighted up instead (he always sees the fritters as a little bit of a treat). Sure enough, the man LOVED the fritters and kept asking for more! Nice trick, if I may say so myself. Healthy brunch but nevertheless delicious! Cook the broccoli and cauliflower in a lightly salted boiling water until tender (about 7-8 minutes). Drain and mash (with fork or a potato masher). Stir in the rest of the ingredients and mix well. Heat oil in a small skillet/pan, and spoon 1/4 cup of mixture into the pan, flatten with a spatula. Fry until both sides are golden brown. Remove from pan and repeat the process. 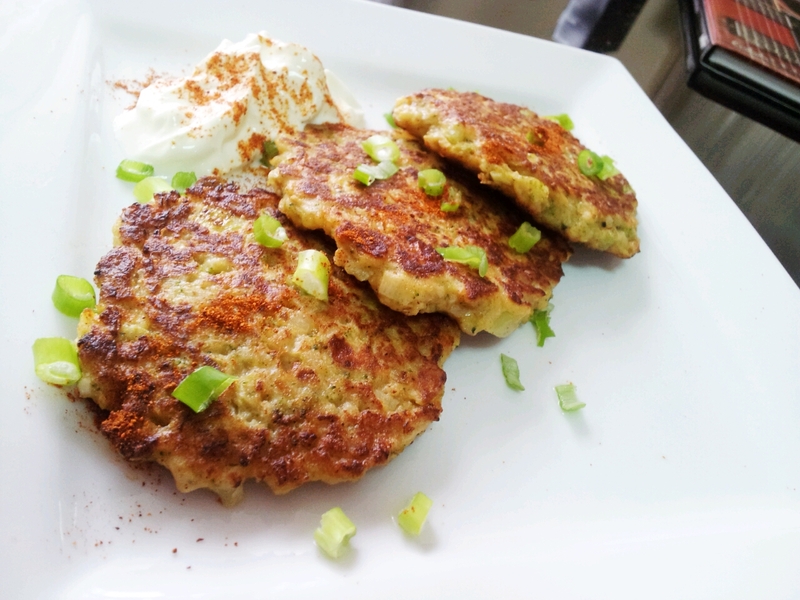 Serve the fritter with a dollop of Greek Yoghurt, sprinkling of Spring Onions and more Cayenne Pepper if you like it hot. For a more decadent treat, fry a few strips of bacon and add a poached egg on top. Mmmmm. I think I’m hungry now. If you have a man (or boy) at home who absolutely despises broccoli or cauliflower, this is the way to sneak them in. Although you don’t really need an excuse to make this at all. Playing with food is fun! hi kelly, thanks for dropping by my blog earlier on the chicken piccata and also the recent one. How are you? I’ve been wanting to make corn fritters , just bought some corn kernels ..not sure when i want to make them tho 😦 I’m also not a great lover of cauliflower but i think i might like them in fritters..thanks for the idea! Hey thanks for dropping by and leaving comments. Combine the unloved cauliflower with lovely corn! You won’t even notice the cauliflower. This is a wonderful idea to eat broccoli and cauliflower together and perfect for my kids who tend to dislike both. I love both of them, and this might be the only way that I can enjoy and kids would eat… Thanks for the recipe! These look to.die.for! I was just telling a friend I wanted to make some tempura – broccoli, cauliflower and sweet potato being my faves, but now I just want to make these! Go give it a go! They are delicious for adults, makes and kids alike! i also cook vegetable fritters with carrots, squash , chayote and malunggay leaves, but i will absolutely try this one for a change. Thanks for the recipe. Sounds lovely!! Yeah this is a very versatile recipe indeed! I too like viewing food blogs in the late hours… Bad habit! I hope ou managed to snack healthily! I’ve never cooked before but I’m gonna try this! Pingback: Welcome monsoons with 7 easy and delish delicacies!